The Segal Residence, Eastern Florida. 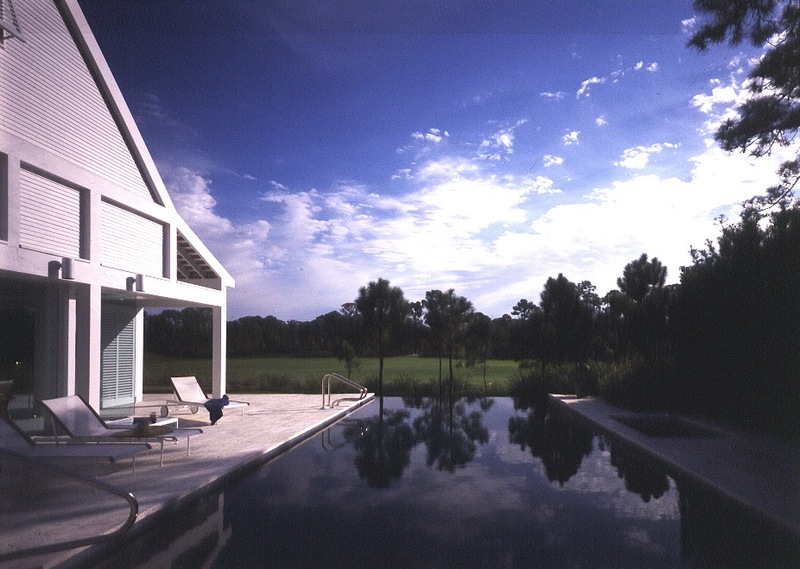 The house is sited to focus on the singular view over a small water hazard, a green fairway, and a tall stand of loblolly pines beyond. The proximity of neighbors to the right and to the left is close. The challenge here was to site the house with the major view enjoying the tapis vert of the fairway while blocking out the surround neighbors. The house and the landscaping create an isolated island in this community of Roman tile roofs and pink stucco. The program called for a trust "Florida House." 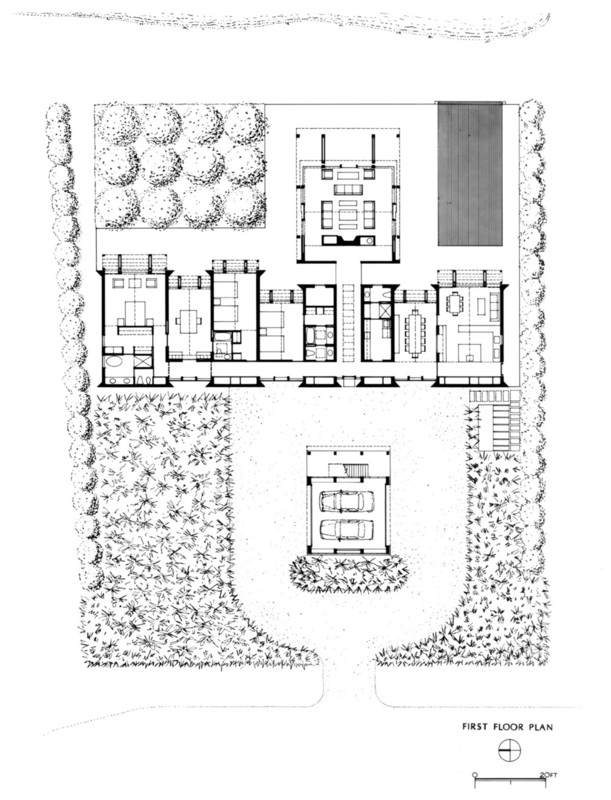 The resulting concept then was to abstract the early Florida "crackers" house which adequately addresses the climate and the seemingly endless sunlight. On entering the site, the tall black bamboo (now 40 feet tall after 10 years of growth) completely conceals the house and entry doors. The garage has a guest suite above whose massing and design is repeated in the scheme by the nearby freestanding living room. Sunscreen and louvers protect the interiors from the tropical climate and announce its compatibility with the region and permit isolation from its neighbors. The first pavilion contains the garage with quarters above. It is freestanding and deliberately conceals the entry from the street. The first pavilion is repeated at the rear of the site and consists of one great space assigned to the living room with three glass-filled walls defining this light-infused room. The room culminates the sequences of entry begun at the street. The three bedrooms plus library flank one side of the entry overlooking a small pond and the lush Florida fairway to the right of the entry: the dining room and kitchen open out onto the pool house. 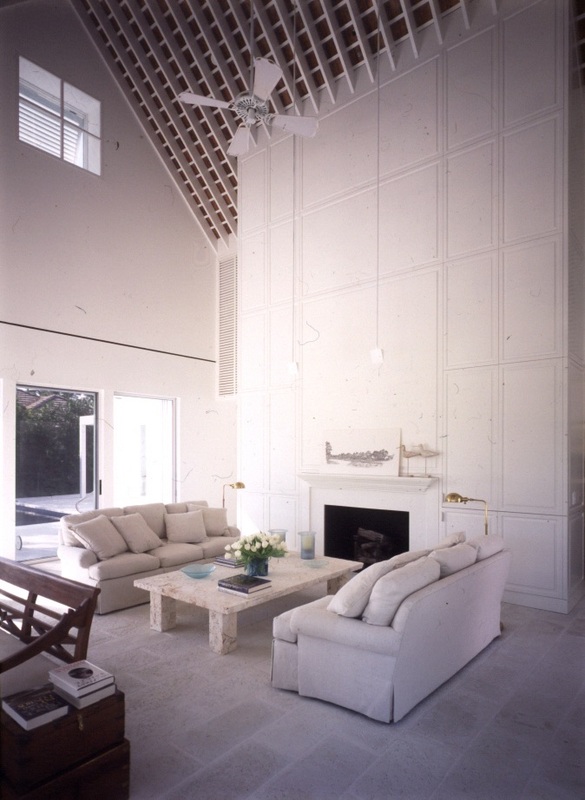 With the dining room and kitchen to the right, each of these spaces occupy its own pavilion and high ceilings within. The long "street" or corridor is lit by alternating glass walls protected by louvered panels from the sunshine.